Simply email your photo to bobtailsrescue@aol.com with the subject heading of ‘Photo Competition’ followed by your animal’s name and your name. There’s a £1.50 entry fee for each photo submitted which should be paid via our Paypal account. Either click on the Donate button on our website and pay £1.50. (Make sure you add a note to the ‘Special instructions to seller’ section sayings ‘Photo Competition’ followed by your animal’s name and your name so we can match the payment to your photo!). Or just log in to your own Paypal Account and send money to bobtailsauction@aol.com (again make sure you put the subject as ‘Photo Competition’ and the message your animal’s name and your name so we can match the payment to your photo!). You can enter as many photos as you like but remember to send a £1.50 entry fee for each photo. Photos must be of good quality so set your camera to the highest setting. The closing date for entries is Sunday 28th April 2013 – so get clicking!! Winning photos will be posted on our website and Facebook and we will try to get as many of the other entries on as well. No limit on number of photos submitted. Only digital photographs emailed to Bobtails and the entry fee of £1.50 paid via Paypal will be acceptable. Photos should be of a high resolution. Pictures entered must be your own photograph and not published before. Only pictures of rabbits or guinea pigs are acceptable for this competition. The whole animal must be shown in the picture with an uncluttered background. The closing date for the competition is 28th April 2013. Any photographs received after this date will not be included in the competition. 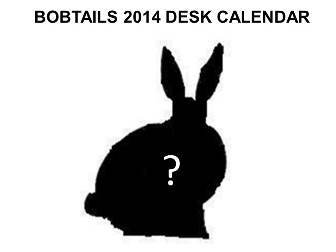 You agree to Bobtails using the picture on a printed calendar and/or on their website, Facebook and Twitter. Judging of photographs will be carried out by a panel of Bobtails volunteers. Their decision is final. Bobtails will NOT enter into any correspondence regarding why pictures were not included in the calendar. Bobtails reserve the right NOT to post on their website and Facebook any picture they deem inappropriate. Bobtails will NOT forward pictures to any third party.